A peripheral vascular bypass, also called a lower extremity bypass, is the surgical rerouting of blood flow around an obstructed artery that supplies blood to the legs and feet. This surgery is performed when the buildup of fatty deposits (plaque) in an artery has blocked the normal flow of blood that carries oxygen and nutrients to the lower extremities. Bypass surgery reroutes blood from above the obstructed portion of an artery to another vessel below the obstruction. Aortobifemoral bypass surgery, which reroutes blood from the abdominal aorta to the two femoral arteries in the groin. Femoropopliteal bypass (fem-pop bypass) surgery, which reroutes blood from the femoral artery to the popliteal arteries above or below the knee. Femorotibial bypass surgery, which reroutes blood between the femoral artery and the tibial artery. 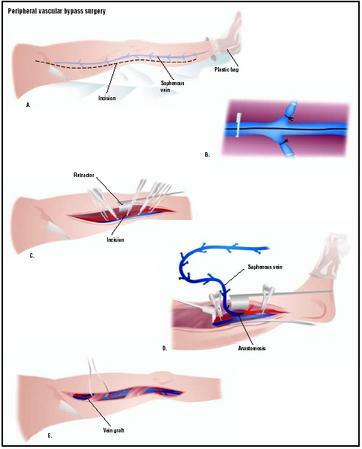 A substitute vessel or graft must be used in bypass surgeries to reroute the blood. The graft may be a healthy segment of the patient's own saphenous vein (autogenous graft), a vein that runs the entire length of the thigh. A synthetic graft may be used if the patient's saphenous vein is not healthy or long enough, or if the vessel to be bypassed is a larger artery that cannot be replaced by a smaller vein. Peripheral vascular bypass surgery is performed to restore blood flow (revascularization) in the veins and arteries of people who have peripheral arterial disease (PAD), a form of peripheral vascular disease (PVD). People with PAD develop widespread hardening and narrowing of the arteries (atherosclerosis) from the gradual build-up of plaque. In advanced PAD, plaque accumulations (atheromas) obstruct arteries in the lower abdomen, groin, and legs, blocking the flow of blood, oxygen, and nutrients to the lower extremities (legs and feet). Rerouting blood flow around the blockage is one way to restore circulation. It relieves symptoms in the legs and feet, and helps avoid serious consequences such as heart attack, stroke, limb amputation , or death. than age 70. In people younger than age 70, it occurs more often in men than women, particularly in those who have ever smoked or who have diabetes. Women with PAD live longer than men with the same condition, accounting for the equal incidence in older Americans. African-Americans are at greater risk for arterial occlusion than other racial groups in the United States. The circulatory system delivers blood, oxygen, and vital nutrients to the limbs, organs, and tissues throughout the body. This is accomplished via arteries that deliver oxygen-rich blood from the heart to the tissues and veins that return oxygen-poor blood from organs and tissues back to the heart and lungs for re-oxygenation. In PAD, the gradual accumulation of plaque in the inner lining (endothelium) of the artery walls results in widespread atherosclerosis that can occlude the arteries and reduce or cut off the supply of blood, oxygen, and nutrients to organ systems or limbs. Peripheral vascular bypass surgery is a treatment option when PAD affects the legs and feet. PAD is similar to coronary artery disease (CAD), which leads to heart attacks and carotid artery disease (CAD), which causes stroke. Atherosclerosis causes each of these diseases. Most often, atherosclerotic blockage or narrowing (stenosis) occurs in the femoral arteries that supply the thighs with blood or in the common iliac arteries, which are branches of the lower abdominal aorta that also supplies the legs. The popliteal arteries (a portion of the femoral arteries near the surface of the legs) or the posterior tibial and peroneal arteries below the knee (portions of the popliteal artery) can be affected. Just as coronary artery disease can cause a heart attack when plaque blocks the arteries of the heart, or blockage in the carotid artery leading to the brain can cause a stroke, occlusion of the peripheral arteries can create life-threatening conditions. Plaque accumulation in the peripheral arteries blocks the flow of oxygen-carrying blood, causing cells and tissue in the legs and feet to die from lack of oxygen (ischemia) and nutrition. Normal growth and cell repair cannot take place, which can lead to gangrene in the limbs and subsequent amputation. If pieces of the plaque break off, they can travel from the legs to the heart or brain, causing heart attack, stroke, or death. high levels of blood cholesterol and triglycerides. Sometimes the body will attempt to change the flow of blood when a portion of an artery is narrowed by plaque. Smaller arteries around the blockage begin to take over some of the blood flow. This adaptation of the body (collateral circulation) is one reason for the absence of symptoms in some people who have PAD. Another reason is that plaque develops gradually as people age. Symptoms usually don't occur until a blockage is over 70%, or when a piece of plaque breaks off and blocks an artery completely. Blockage in the legs reduces or cuts off circulation, causing painful cramping during walking, which is relieved on rest (intermittent claudication). The feet may ache even when lying down at night. When narrowing of an artery occurs gradually, symptoms are not as severe as they are when sudden, complete blockage occurs. Sudden blockage does not allow time for collateral vessels to develop, and symptoms can be severe. Gradual blockage creates muscle aches and pain, cramping, and sensations of fatigue or numbness in the limbs; sudden blockage may cause severe pain, coldness, and numbness. At times, no pulse can be felt, a leg may become blue (cyanotic) from lack of oxygen, or paralysis may occur. When the lower aorta, femoral artery, and common iliac arteries (all in the lower abdominal and groin areas) are blocked, gradual narrowing may produce cramping pain and numbness in the buttocks and thighs, and men may become impotent. Sudden blockage will cause both legs to become painful, pale, cold, and numb, with no pulse. The feet may become painful, infected, or even gangrenous when gradual or complete blockage limits or cuts off circulation. Feet may become purple or red, a condition called rubor that indicates severe narrowing. Pain in the feet or legs during rest is viewed as an indication for bypass surgery because circulation is reduced to a degree that threatens survival of the limb. Early treatment for PAD usually includes medical intervention to reduce the causes of atherosclerosis, such as lowering cholesterol and blood pressure, smoking cessation , and reducing the likelihood of clot formation. When these measures are not effective, or an artery becomes completely blocked, lower extremity bypass surgery may be performed to restore circulation, reduce foot and leg symptoms, and prevent limb amputation. Bypass surgery is an open procedure that requires general anesthesia. In femoropopliteal bypass or femorotibial bypass, the surgeon makes an incision in the groin and thigh to expose the affected artery above the blockage, and another incision (behind the knee for the popliteal artery, for example) to expose the artery below the blockage. The arteries are blocked off with vascular clamps. If an autogenous graft is used, the surgeon passes a dissected (cut and removed) segment of the saphenous vein along the artery that is being bypassed. If the saphenous vein is not long enough or is not of good quality, a tubular graft of synthetic (prosthetic) material is used. The surgeon sutures the graft into an opening in the side of one artery and then into the side of the other. In a femoropopliteal bypass, for example, the graft extends from the femoral artery to the popliteal artery. The clamps are then removed and the flow of blood is observed to make sure it bypasses the blocked portion of the affected artery. Aortobifemoral bypass surgery is conducted in much the same way, although it requires an abdominal incision to access the lower portion of the abdominal aorta and both femoral arteries in the groin. This is generally a longer and more difficult procedure. Synthetic grafts are used because the lower abdominal aorta is a large conduit, and its blood flow cannot be handled by the smaller saphenous vein. Vascular surgeons prefer the saphenous vein graft for femoropopliteal or femorotibial bypass surgery because it has proven to stay open and provide better performance for a longer period of time than synthetic grafts. Bypass surgery patients will be given heparin, a blood thinner, immediately after the surgery to prevent clotting in the new bypass graft. Blood pressure and pulses—pressure measurements are taken in the arms and legs. Pulses are measured in the arms, armpits, wrists, groin, ankles, and behind the knees to determine where blockages may exist, since no pulse is usually felt below a blockage. Doppler ultrasonography—direct measurement of blood flow and rates of flow, sometimes performed in conjunction with stress testing (tests that incorporate an exercise component). Angiography—an x ray procedure that provides clear images of the affected arteries before surgery is performed. Blood tests—routine tests such as cholesterol and glucose, as well as tests to help identify other causes of narrowed arteries, such as inflammation, thoracic outlet syndrome, high homocycteine levels, or arteritis. Spiral computed tomography (CT angiography ) or magnetic resonance angiography (MRA)—less invasive forms of angiography. If not done earlier in the diagnostic process, ultrasonography or angiography procedures may be performed when the patient is admitted to the hospital. These tests help the physician evaluate the amount of plaque and exact location of the narrowing or obstruction. Any underlying medical condition, such as high blood pressure, heart disease, or diabetes is treated prior to bypass surgery to help obtain the best surgical result. Regular medications, such as blood pressure drugs or diuretics , may be discontinued in some patients. Routine pre-operative blood and urine tests are performed when the patient is admitted to the hospital. After bypass surgery, the patient is moved to a recovery area where blood pressure, temperature, and heart rate are monitored for an hour or more. The surgical site is checked regularly. The patient is then transferred to a concentrated care unit to be observed for any signs of complications. The total hospital stay for femoropopliteal bypass or femorotibial bypass surgery may be two to four days. Recovery is slower with aortobifemoral bypass surgery, which involves abdominal incisions, and the hospital stay may extend up to a week. Walking will begin immediately for patients who have had femoropopliteal or femorotibial bypasses, but patients who have had aortobifemoral bypass may be kept in bed for 48 hours. When bypass patients go home, walking more each day, as tolerated, is encouraged to help maintain blood flow and muscle strength. Feet and legs can be elevated on a footstool or pillow when the patient rests. Some swelling of the leg should be expected; it does not indicate a problem and will resolve within a month or two. During recuperation, the patient may be given pain medication if needed, and clot prevention (anticoagulant) medication. Any redness of the surgical site or other signs of infection will be treated with antibiotics . Patients are advised to reduce the risk factors for atherosclerosis in order to avoid repeat narrowing or blockage of the arteries. Repeat stenosis (restenosis) has been shown to occur frequently in people who do not make the necessary lifestyle modifications, such as changes in diet, exercise, and smoking cessation. The benefits of the bypass surgery may only be temporary if underlying disease, such as atherosclerosis, high blood pressure, or diabetes, is not also treated. A femoropopliteal or femorotibial bypass with an autogenous graft of good quality saphenous vein has been shown to have a 60–70% chance of staying open and functioning well for five to 10 years. Aortobifemoral bypass grafts have been shown to stay open and reduce symptoms in 80% of patients for up to 10 years. Pain and walking difficulties should be relieved after bypass surgery. Success rates improve when the underlying causes of atherosclerosis are monitored and managed effectively. The risk of death or heart attack is about 3–5% in all patients undergoing peripheral vascular bypass surgery. Following bypass surgery, amputation is still an outcome in about 40% of all surgeries performed, usually due to progressive atherosclerosis or complications caused by the patient's underlying disease condition. Folic acid can help lower homocysteine levels and increase the oxygen-carrying capacity of red blood cells. Vitamins B 6 and B 12 can help lower homocysteine levels. Angelica, an herb that contains coumadin, a recognized anticoagulant, which may help prevent clot formation in the blood. Essential fatty acids, as found in flax seed and other oils, to help reduce blood pressure and cholesterol, and maintain blood vessel elasticity. Chelation therapy, used to break up plaque and improve circulation. Cranton, Elmer M.D., ed. Bypassing Bypass Surgery: Chelation Therapy: A Non-Surgical Treatment for Reversing Arteriosclerosis, Improving Blocked Circulation, and Slowing the Aging Process. Hampton Roads Pub. Co., 2001. McDougal, Gene. Unclog Your Arteries: How I Beat Atherosclerosis. 1st Books Library, 2001. American Heart Association (AHA). 7272 Greenville Ave., Dallas, TX 75231. (800) 242-8721. http://www.americanheart.org . Vascular Disease Foundation. 3333 South Wadsworth Blvd. B104-37, Lakewood, CO 80227. (303) 949-8337 or (866)PADINFO (723-4636). http://www.vdf.org . Bypass Surgery for Peripheral Arterial Disease. Patient Information, Vascular Disease Foundation, 2003. http://www.vdf.org. Hirsch, M.D., Alan T. "Occlusive Peripheral Arterial Disease." The Merck Manual of Medicine—Home Edition, Heart and Blood Vessel Disorders 34:3. http://www.merck.com/pubs . Peripheral vascular bypass surgery is performed by a vascular surgeon in a hospital operating room . Why is this surgery necessary? How will the surgery improve my condition? What kind of anesthesia will be given? How many of these procedures has the surgeon performed? How many surgical patients had complications after the procedure? How can the patient expect to feel after surgery? How soon will the patient be able to walk? How long will it take to recover completely? What are the chances of this problem recurring after surgery? What can be done to help prevent this problem from developing again? I have had some cramping in my left leg,especially if I climb stairs. I recently had an Ultra Sound test.I had to call my doctor for the results and then I only got to talk to the rceptionist. He relayed the message through her that he was seting up an appointment with a specialist! Shouldn't my doctor go over the results of the test and explain them to me before sending me to another doctor?I am very upset about this procedure. my husband had a fem-pop done to eg on 090605: the graft became infected and was removed: He is scheduled to undergo the surgery again on 060606: is there a possibility of any complications because of a second incision to the same surgical site? my husband had both legs done 08\07 left leg colted off re done 11/07 still has swelling,pain,numbness is this normal. just wanna ask a simple question that when we tie the tributaries of the saphenous vein to connect it to the obstructed arteries..gonna the doctor leave the tributaries of that vein tied??? is that vein not important vein or essential to our body??? Hi, My dad had his AAA operation on 18/03/08, they operated from the groin and insterted a stent. They went back in a week later as he had a endo leak. There after he caught a infection and had 3 other operations but none worked. they have now tied the femoral artery off. He has no feeling from below his knee to the foot. Can he walk like this, or will he need a bypass? Will he able to walk after the bypass? The statement: "Peripheral vascular bypass surgery is a mechanical way to reroute blood, and there is no alternative method." while correct, does not address the principal question regarding the indication or contraindication of other mechanical treatments, such as peripheral endarterectomy. I believe that "Alternatives" should include other mechanical treatments of peripheral vascular disease, and not simply refer to alternative bypass methods, which of course, there are none, since the two alternatives, autogenous and prosthetic, are included in the definition of bypass. Thanks, they have now done the femoral obturator bypass. They Shin area on the leg started going dry and had peeling skin, the skin looks very dark around that area. The doc's are trying to save the leg, they reckon this may help. They weren't best pleased with the toes, as they didn't feel so warm. Do you think it will come down to a amputation? Can a bypass heal tissue that is already dead? Its now been 1 week since the bypass. The toes are slightly black on the tips, the doctors are saying they can't see a big change with the leg. Do you think he will need amputation? Are toes likely to change colour? Of the complications listed, I see clots but I don't see collapsed artery. Is Collapse of an artery a possible complication? My doctor is recommending this surgery based upon ar arterty collapse from an accident, i can walk an do moderate exercise i would like to be able to run again and do very heavy exercise i am 38 years old. Is it possible that I will be able to run real distances again?? Once i do the operaton am I limiting the chances of the blood rerouting itself?? I believe after reading all of the info regarding PAD surgery I would not do it. My aunt is losing her foot as we speak because of the failure of the procedure. She is 66 and had blood clots. Apparently the thinners did not work. I don't know about the treatment options but John Hopkins or Mayo must have better treatments than this. PAIN LEFT GROIN,THIGH,CALF,ANKLE,BOTTOM OF FOOT. ALL LEFT SIDE. MY ONLY PROBLEM OF THE LIST OF CAUSES IS, I SMOKE. EVERYTHING ELSE IS GOOD. HAD A HEART CATH 19 MOS. AGO WAS FINE. MY PROBLEMS STARTED AFTER HAVING GALLBLADDER SURGERY 19 MOS. AGO. I AM ON PLAVIX, HAVE BEEN FOR ABOUT SEVEN YEARS. HAD ANGIPLASTIC 7 YEARS AGO, MINIMUM PLAQUE. This information may be helpful to you in deciding whether to have this surgery or not. My husband had fempop op on 1st June 2010, still has pain, swelling of lower leg and ankle, numness and leg very sensitive. Is this normal after this time, he cannot walk very far yet, and sits with leg up most of the time! My sister was suppose to have an angigram this past week-but nothing could be done-because of total blockage. They are going to do a stress test (no Treadmill) this week and then a preop appt the following week. How soon does the actual bypass usually happen after that? my mom had bipass surgery because of blockage of bllod vessel to the feet. She has severe pain in her feet after surgery and cannot walk. Is this normal? I had bypass op on left leg from the groin area to lower leg.My leg then got infected and I was re-admitted to hospital.After further 2 months I have pain in my foot, my ankle and sporadic 'shooting pains' esp in calf, also numbness in shin!My ankle area looks as though blood has settled there and pain developes when walking. How do I find answers to questions asked? I had by pass surgery I August and I have twinges in my knee but am walking fine. My husband had surgery on his left leg he had completely blocked from the knee down and was cold as ice to his toes. They did surgery to remove the clots lots of them and now his foot in the arch and his toes tingle and feel asleep all the time they are really bothning him. He had a brain stem stroke in 2006. He is short on patients. How can I help him or what can he do tohelp this? He is on blood thinner (cumuden) I didn't spell that right.his count is up to 2.6 now. His leg is still sore in the upper part.It has been 1 month from surgery.He is 60 yrs old. I had surgery on my left leg. a procedure where the surgon drilled out the plaque as I had a blockage that was missed when a stint was put in three years earlier. My problem was, that after the cath was placed for the surgery, or withdrawn, I dont know which I developed white cell blood clotting in my right leg. The opposite leg that had the procedure done. I noticed that I was losing feeling in my foot after the procedure and informed the surgical team that I could not feel my right foot. A utrasound was preformed and a blockage waa found just above my knee. The surgon that did my first procedure, then did a entry surgery, wher he opened my right leg to repare remove the clot and redo artery. After the surgery about three to four hours later clots started forming again as before I could not feel my foot. A cat scan was done and determinded clotting was again the culprit. A radiologist performed another procedure and remarked he had never seen clotting so agressive. This procedure was so that a anti clotting drug could be dripped in to disolve the clot. I now know that this procedure did not work, as I over heard one of the nurses in the ICU unit state that procedure failed, not to me was this said, I just over heard it. the next morn A fourth and final cath surgery procedure was preformed by anothe radiologist, inserting two medicated stints, approx three inches long in my leg. My question is what the hell happened, I am not satified with the respond that medicine is not an exact science. I am not a medical professional, but common sense tells me that, if these were white blood cells causing the clotting that I had been introduced to a bacteria to my right leg thru the cath placed for the procedure, resulting in the clot formation. As far as I can figure out my leg below the knee was with out blood flow for between 8 to 11 hours between all of the procedures. It has been four months since this has happened and I still do not have complete feeling in my foot or the front of my leg, hoe long will it take to get back? Did the surgical team cause this? If you can help me please e mail me and explain. Has anyone else experianced the same thing? I had a by pass surgery about Seven years a go on my iliac arty to my right leg and now it feel so painful almost like my leg is cramping up again. Im worried something is wrong. Help Im scared I might have a malfunction in my bypass or something has gone bad. I had cararctation of the aorta and wen they put the stent in that I have my iliac collapsed and they had to bypass it and now I feel like something is not right. Please help ! A recently performed angiogram showed my one-year-.old left leg by-pass is no longer working and there is extreme blockage in my veins. My options are 1) do nothing and live with the pain; 2) repeat the by-pass (not recommended), and 3) amputation of the leg. I am diabetic (not controlled), high blood pressure (under control), non smoker, 68 years old female, who is completely devastated. As late as six months ago I thought everything was going well. Do you have any other options I can try. I'm willing to try anything. Is it common to have extreme post op surgical site pain as well as foot swelling. We are now 24 hrs post op and experiencing this. My 85 year old father had surgery to remove plaque from femoral artery. He bled 3 times after and endured another 3 operations after each bleed, a total of 4 operations in 3 weeks. I feel he has been butchered by a vascular surgeon that has no idea what he is doing, any comment? my husband had fermoral gusset inserted and his arteries in the legs cleaned out. the op was 3 weeks ago. he is getting sudden shooting pains from his groin down his leg, this makes him whince. is the pain normal? thank you, mrs robinson. my mothers right leg has blockage and her toe has turned black we are waiting to see if another doctor can do a by pass if not they want to amputate the leg. I dont know what she should do either one might kill her or might get gangrene etc. do you know of any other circulation treatments? Please Help? i am 51 year old woman i am going in the hospital friday for a bypass they are going from above my belly button then down to my legs they tried stients but couldnt get them in. i am scared i will say that the surgery the dr. said takes 2 hrs. how will they go from the belly area to the legs? my husband had heart by pass surgery in 2007 and now he has a bunch of blood vessels that had grown in the chest and is going to the the heart and lungs and the ones that is going to the lungs is taking blood away from the heart supply what can be done to correct that his doctor has never seen this before. My Dad was just moved to a private room an hour ago. He's progressing well. He stayed in the ICU for 4 days since surgery on Tuesday. Tough surgery as expected .. Here's the website for clear explanation about the surgical procedures. Thanks for keeping him in thoughts and prayers. My husband is 82 yrs. old and has been diagnosed with necrosis in his right foot. He was told by his family doctor that he is not a candidate for any type of surgery due to the fact he is on coumidin and he would probably would have a massive stroke; however, I am wondering if this femo-pop surgery would be something that he could indur with major complications. Appreciate your comments. My husband had a single by pass surgery March 8, 2011. A artery from his left chest was re-routed to the widow maker artery to correct a 80% blockage. Since the surgery he does not feel any better than he did prior to having the surgery. I have taken him back to cardiologist several times and they keep saying it is anxiety and depression. I have been with hime for over 35 years and do not see the depression or anxiety they say he has, and he says it's not that at all. Another heart cath was done just this past Tuesday and they said that the artery that they grafted has shriveled some and is not doing what they thought it was going to do, but his blood flow is great. I am very concerned because he has same symptoms he had when they said he had a 80% blockage. I am afraid they are missing something. Is there anyone out there that can give me some answers. Very concerned for his health. I had knee surgery 4 weeks ago and had 3 procedures, I am non-weight bearing for another few weeks. I am quite concerned because the blood flow to my lower leg and foot becomes immediately reduced whenever I am up on crutches (this is the non-wieight bearing leg). The color remains dusky blue the whole time I am up on crutches or standing or for that matter whenever my foot stays lower than my waist level. For example if I am in a wheel chair, my foot swells (which post knee surgery is not terribly unusual) but it turns dusky. The only way the color returns to my foot and lower leg is when I raise my leg back up onto a pillow when I am sitting or laying. I am very concerned that the main vessels in my leg are somewhat compromised post -surgery. I am even more concerned what will happen when I start forcing my leg flexion past 90 degrees as pain occurrs in the same area as the scar/surgical site whenever I strain the area trying to flex my knee. Please respond as to what can be done to assess this ongoing circulation issue and prevent any further exacerbation as the physiotherapy will become more extensive with attempting to weight bare very soon. I had the bypass on my leg three months ago they put a graft in a little above my knee to just below my knee on the inside.The outer part of my leg is numb but I can walk ok and does not hurt much. My problem is it keeps filling up with fluid. They have drained it now about five times. When they drain it they fill it full of antiboticks and alchohol . It fills back up in a couple of days. Will it eventually stop or is there something else I can do. They have me stay in bed with leg up but so far has not worked. I do not think they want to open it up cause the fluid is building up where the graft is. Has anyone had this problem? My husband had a Fem-Pop on right leg one week ago. He has been following the surgeons orders and keeping the leg elevated on pillows to keep it within the level of his heart. The incisions are healing well, but I noticed that two days ago that his ankle,inside of the affected leg has turned blue from ankle bone to the bottom of his heel. I called the doctors office and let them know, but the nurse asked me if the foot was cold, and I told her it wasnt. She said that was good. Also wanted to know if he could wiggle his toes, and he can. So she seemed ok with the report of the blue area. But on the evening of the third day, the blue area had darkened and there is now a small red spot in the same area.Why? WHY IS THERE NO MENTION OF THE SILVERHAWK PROCEEDURE FOR PAD? 7 MONTHS AGO I Had bypass surgery done on my lft leg and already it has started to clog up. i am on my way to see my surgeon abouty an angioplasty. no way . the silverhawk is a non-evasive surgery and there has only a 3 day recovery rate. it was developed in 2003 by foxwood tcchnologies and is now being done in major hospitals. why was i not given the option of choosing this surgery. I had aorto femoral bypass surgery august 2011. When can I get back to my normal activities like mowing the yard, driving a car, etc. My 63 year old father had Fem-Pop bypass surgery 3 months ago. However, the wound just would not heal. The district nurses and consultant all assured him that it was nothing to worry about and that the wound was not infected. Sadly, earlier this week, he died suddenly after severe heamorraging from the artery. We haven't been given any information as to why this has happened and looking around the internet it appears to be a rare event. Does anyone have any idea what might have gone wrong? Thanks. Looking at the nurses notes, 3 weeks ago it was commented '4 sutures visible' (which I guess suggests that they should not be!). Following day, different nurse, 'sutures snipped'!!! I am really worried now that the sutures 'snipped' were the graft (PTFE) sutures themselves, which should never be removed. Is that level of incompetence really possible or am I clutching at straws?? I had aortobifemoral bypass surgery done on my stomach and groin area in my legs about 3 months ago,since then I have had some pain in my lower back,and alot of pain and tingling that starts in my lower stomach and goes all the way down to my knees in both legs.Is that normal? Should I be worried about all this pain, because I feel the surgeon may have done something wrong,What should I do now. Unfortunately, I can beat all of you. I've had 18 angioplasties, and 2 bypasses on my legs. In November 2009, when I had my first by-pass, it got infected,and they had to cut out some of my muscle. I almost died 2 times, too. I had to have transfusions. I had to carry around a wound vac for 4 months. I also got foot drop in both feet from the operation. This time, 4 doctors refused to touch me, because I only had one good vein left to use,which means next time they have to amputate. I finally found a doctor at USF, Tampa General Hospital, and had it done in October of this year,(2 months ago).They cut the inside of the leg they took the vein from from my ankle to my groin. The other one they cut in 3 places.Now I have edema real bad in the leg and foot they took the vein from.But, thank you God, I still have my life. I still have to have angioplasty because the leg they took the good vein from has another vein blocked, and I can't walk far because of the pain in my calf. My husband is 53 years old, in 2006 he had an aneurysm that burst behind his knee, stopping all blood flow to his foot, he was within minutes of losing his leg, he had major surger within 1 hour of being admitted to the emergency room. They discovered that he had another one behind his other knee, as well as both femoral and AAA. He also has had stents put in his iliacs as they were narrowing. He has had surgery on all of them with artificial grafts as well as vein grafting in both legs, the artificial ones are in his groin. Between his knee and groin where the graft was done they found a problem, they are doing further tests to determine what is going on. They mentioned that something is not right where the vein that was basically just "clamped off" His surgeon is having the test looked at by the radiologist and is going to get back to us to see what the problem might be and how to proceed. His AAA 6 months ago was a 4.7 and since has not had any significant growth. Initially they said they have never seen someone so young have all 5 at one time. Is the issue in his leg something that can be repaird again with artifical grafting or vein grafts? They had to use vein to restore the flow so he still has pain etc and all other symptoms but is happy to be alive. I was informed by my doctor that sense my artery collapsed behind my right knee that a bypass would also collapse. Why can't I see any responses to questions asked? Some of these questions are the same ones I have. Would be helpful if there was a link to responses. Husband had fem-pop on left leg in Dec. 11.
i had byepass done 4weeks ago the byepass has worked up till now but the nerve and muscle had stuck togather they had to be pulled apart i can not walk for more than ten steps then i get very servre pain can anyone tell me how to get read of this pain. i am posting for some insight. i have a sister who has drank and smoked her way through life. she is 50. had a bypass to one leg about 1 year ago. had a lung bx last summer and developed a clot in other leg and had bypass. had it repeated again in january. she has foot drop and loss of sensation to the leg that has been done twice. she has never stopped smoking and has lung cancer. got radiation for that and now has brain cancer and getting radiation again. anyway she is trying to sue the surgeon. i am appalled. i think with the hx i provided here that it is not the surgeons fault. she thinks she is going to get 100,000 dollars. ( just filed 1 month ago) so my thing is that after reading above comments that these complications are common and especially common if you have cancer and continue to smoke and drink. any thoughts? do surgeons really get sued over common post op complications? i would think that the lawyers would shred this to pieces as she is so non compliant. My husband had vascular bypass done on his right leg. It has been 3 months. He says his leg is numb and keeps him awake at night. What should we do? Hi, I am Bhavesh Soni 36 year old and I am suffering from artry blokeege in both lower linbmy left leg artry is blocke 17cms and my right artryis blocke by 12cms before 8months i also operate my left leg angioplasti but still I am suffering in walking dr. have no reason for blockeg becouse I naver smoke or drinks,no heridity, no colestrole,no suger,ni b.p. My Mom had a few stents put in to her left leg and a year later had a peripheral bypass surgery done. After this surgery she's had about four different surgeries because the doctor says that there is still something blocking the blood flow where he connected the veins for the bypass. Is this normal? Will it ever be ok? Now the doctor is suggesting another surgery where he will take another vein from her other leg or another area in her body to do another bypass surgery. Should we get a second opinion? What are some good questions to ask a second doctor? 13 weeks ago I had a leg bypass and at the moment I am feeling some discomfort in that leg, also around the scare. The wound has healed. I am worried as I am in Europe on holidays and not sure what to look for if anything is wrong, what to do if there is something that I need to be concerned about. What are the progress after an operation like this? Could I be doing to much walking, climbing stairs and hilly roads, I am swimming also as I think sea water is good. I had peripheral bypass April this year. Everything seems to be doing ok but I still have pain around the incision sites even though they healed well. My problem other than the pain is I sometimes feel as if something is dripping on my leg below the scar. It feel cool and wet, but when I check there is no dripping. What can cause this? It happens periodically--when I stand or walk. Anyone got an answer? 6 yrs ago my husband had a complete aorto dissection.It threw a blood clot that shut off of the blood on his right leg. He had a fem to fem to correct this. He is now having stomach pains and other pains in the area. Could this be causing a problem now? This information is indeed helpful and addresses my PAD problem. I am going in for the bypass surgery on 10/29/2012 less than a week away. The angioplasty procedure would not resolve the blockage according to what the surgeon showed my wife and me. I have severe calcified blockage in 3 places in my right leg. I waited too long and endured the severe calf and thigh pain thinking it would work itself out (go away)thet proved to be a mistake. Why aren't the links and responses visible?? had operation march 2012, still have pronounced swelling in groin and stomach which is very uncomfortable. Operation was from chest, bypass down through stomach into groin. How long before this swelling goes down? Its been 20 years since my fem-pop surgery. Recently, I have had pain in my leg and they go numb after activity. I use trental. How can I read the answers to the above questions? My right foot was becoming numb, was becoming 'discolored' and was told I needed a Vein Bypass Had Vein Bypass in my right leg 12/2009. There was no appreciable relief from the operation, and again, my right foot is always 'half asleep' and is dark colored when I get up in the morning. Is there any recourse for failed operations? My insurance and I paid a substantial sum for this! I had a fem-pop done on my left leg on 12-21-2011 and went back to work that 03-2012 I'm a transporter at my local hospital. Last week I was in my yard pulling weeds from my flower bed I felt like something torn in my leg but no pain. I keep a check on the color and pulse in my leg but today I'm having pain in my leg what should I do to see if I did tare something? Or what should I look for? Thanks for this artical it was good reading. I had this surgury done 2 clots removed from right leg. 1 from the left they also found 2 areas with 100% blockage. I was cut open on both sides of grion and from my left knee almost to my ankle I did have a bypass but rather they used a balloon to clean it out surgury went from 3 hrs Max to 9 very concerning to my family. Question is I had this done in Jan. 2013. I know have tingling in my feet and more my toes. My doc. Says this will go away it is because my toes are now getting blood flow something theft went with out for long time. My feet were gray by the time I had surgury. Its been 4 months. Did any else have this? Will it go away about how long? If nothing else it got me to quit smoking after 40yrs. Something the 5 hearts attacks didn't. Thanks for any help. I had the PVB operation after suffering walking numbness in the buttocks and rest pain in the middle of the night,my left leg went completely numb until i got out of bed and tried to get some circulation back. My operation cured the rest pain for now,but i can not walk any great distance,the Surgeon told me that my operation was a salvage operation but when I tell him that my walking is very limited without numbness in the buttocks and my feet soles are numb after the operation(but was OK before the operation) the surgeon seems uninterested to investigate any further to help. I only wished I had gone sooner to the Doctor at the first signs of the disease but I was working and based abroad at that time until I had to give up my very well paid job, and a job I loved because I just could not stand the pain in my legs any more.So for me the PVB operation helped rest pain,but as i can not walk any great distance i am fighting weight problems even though my food intake is small because the circulation in my legs is very poor. I had aorta bi femoral bypass surgery performed in March 2013. I am so pleased with the results. I was unable to climb stairs much less walk any distance. My artery was 100% occluded. Since I have had my surgery, I am able to walk 2-3 miles per day and feel better than I have in years. Mike - I had this in December 2010 and I am so miserable! My legs are in constant agony and I seem to only be getting worse! Any suggestions? Can someone please tell me who the author is so that I can reference this article in an assignment? Is it true that the synthec vein will only be good for one year? My friend has had to have 2 bypass surgery and he ended up with a infection (twice) and now they are saying that the artery only lasts up to a year and they can't do more surgery because they don't think he can get off blood thinners long enough and the surgery would be to much for him. If that is the case how if the vein fails he would lose his leg and they would have to do surgery for that but can't replace the vein. where are the answers to these questions. than you, very interesting article. thanks again. Have had aorta bifemoral bypass five weeks ago. Still feel nauseous. When can I start exercising??? Why is that periodical feeling of wetness and coolness in lower limb of my mother's left leg? Whereas, actually there is no any sort of dripping on check.Any suggestion please! IAM GOING TO HAVE A FEM POP JUNE 23, 2014. I AM SCARED. MY RIGHT LEG HURTS SO MUCH MY LFOOT IS SO RED. I HAVE HAD MY NECK DONE DUE TO 90% BLOCKED CARODID ARTERY. I WILL LET YOU ALL KNOW THE OUTCOME. I had aortal bifemeral bypass on 4/7/14. I recovered to a point, but now seem to have stalled. Still can't sit upright comfortably, although I have progressed to walking a mile or more a day. I continue to do the exercises that PT taught me and try to increase my performance level daily. I no longer sense improvement. I am definitely better than I was prior to surgery with respect to walking, but my energy levels remain low, I am still stiff in my abdomen with occasional shooting pains. I jokingly claim that there is an alien living in my belly and he occasionally pokes me just to get even! I would appreciate feedback to assure myself that all of this is normal and will eventually fade. Yes I have this and had surgery some 3 years ago as well as 2 stents. I know smoking is the devil however, I do smoke and can't seem to quit. A contributing factor would be that I had a job for the last 18 years working nights until 3:30 a.m. as well as standing for 9 hours a night. After surgery I thought that I would get relief - which I did somewhat but walking is hard must stop after a block or so rest it and then keep going. I do exercise (swim) which is easier on the leg abnd have started taking nitric oxide NO3 and hope this will help as I refuse to use wheelchair or scooter - I am tough enough to endure the pain and also a matter of pride I will not succumb. Mr Dr. Guzman of St. Boniface Hospital in Winnipeg, Manitoba is top notch but now my body has to listen to what I want - I can live with the scar but I cannot live without walking. All the best to everyone. If anyone else has tried this for PAD let me know. There has to be some good news out there. Had bypass on leg in june can't feel knee to foot front part of leg, is there any legal action I can take. I had iliac arter disease surgery on my right leg four days ago and stayed in the hospital ICU for overnight. Now my right foot has pins and needles, is swollen, and feels cold, but is actually warm to the touch. Is this normal and how long before it might go away? I wonder if the surgeon can do something about this. I had FemPop (right leg) surgery 6 days ago. 37 inch incision is healing nicely without complications but some pain. The problem is the numbness in the front leg from about the knee cap down the shin to the ankle. The back side of the calf has feeling. Some feeling in the bottom of the heel and toes. Doctor says give it time and it'll return to normal. He believes it's a residual from the nerve block that was administered for the procedure. Do you agree the numbness will slowly go away and feeling will return? My 85 year old mother had fem-fem and fem-pop bypass surgery 9 days ago for PAD with pain and non healing wounds. Co-morbidities include severe lumbar DJD, previous CABG and mild COPD. She developed A-fib which has gradually improved, however marked edema persists. Post-operatively the wounds to her lower leg are healing well and perfusion is good. Initially pain was moderate to severe, but improved. Subsequently she has been in excruciating pain with inadequate control with oxycontin and hydromorphone for breakthrough pain. Gabapentin is also being given. Everything I read about this procedure indicates such pain levels at this time would be unlikely and unexpected. If there are no indications of occlusion or decreased perfusion or infection, what might explain the severe pain? Mike, (comment #86), May in ask who your surgeon was and where you had your surgery? My father is facing the same ting, but I'm seeing so many failure stories from people. Thank you for any advice. I have had a total of 7 pad surgeries, a couple double bypasses when they would do one leg then rush me down less then an hour later to do the other because they both shut down, they have gone in thru the groin areas, all the way up my stomach due to finding and aneurism , up the side of my stomach in a hook. I cardiac arrested 3 times and had a heart attack due to all the surgeries and complications with mild memory loss due to the arrests. I then switched dr's because I lost faith after all of that and yet another failed surgery. He then went from my chest all the way down and said it's the last surgery on that side anyone can do because of all the previous damage done from all the others and it's now failing also. I have been dealing with the pain and barely being able to walk for almost a year now and I'm fighting them taking my leg which they say is the only alternative. Right now I'd rather deal with the pain until I can't no more. they say they can do one more try on the right leg. so right now in my left leg there is a tiny trickle of blood getting thru and on the right it's 50% shutdown at this point . I'm on so many meds my head spins but I have just lost faith in dr's and hospital staff. Mistake after mistake has been made and they seem to think i'm just supposed to be ok with them. from giving me wrong meds, misdiagnosis, sending me for test with the wrong person's charts etc. I'll just deal with it at home til I can't. my advise, do your research, make sure you have a damn good dr. and check him out and make sure your in a top rate facility. At one point they told me I contracted a bug in my lung while I was in the operating room and they are sorry but it is a very common thing. I have letters where they sent me apologizing to me for my experience in the Operating room due the bug. I am in severe pain every single day all day so please do your research and don't trust blindly like I did. is there any worthwhile alternative to aortofemoral bypass surgery? If surgery done and impotency results, can this be reversed? How? i had right leg femoral artery replacement in december of 2014. my calf and right foot are still swelling along with my right foot feels as though it is broken. is this normal and how long should it take before my foot and calf start to showing some relief. My father had bypass surgery and about 30 hrs after there is swelling in his foot and turning red is this normal? I had a femoral by-pass April 1st 2015 and still suffering leg pain. Is this normal? Found this site to be very interesting and educational regarding my own surgery. I will be having a fempop bypass soon. I live alone and have a small dog. When I get home,will I be able to cook and care for myself and my dog? Or should I start planning other arangements. I already know that I can not afford nor qualify for in home post op. Care. There is nobody here to help me as I just moved to a new area. Should I have this done near one of my close friends? I have blockage in my legs and I don't know what to do. My doctor says that a artificial vein only lasts 2 to 5 years what happens after that. I can't walk very far with getting cramps and legs get stiff. Is the risk worth taking. I need more information. I had bypass surgery in march of 2015, the groin area is still num and burning sensation is still there I went back to work for my 8 hours days when I come home its the worse pain ever so what can I do. my husband had abdominal aorta bypass surgery last year and a graft was inserted. He is experiencing a rash on his chest and back,.He has had this for five weeks. Just wondering if his body could be rejecting the graft. Has there been any examples of this in the past. The dermatologist cannot find out what is causing this. I can resume outdoor pursuits and other activities involving my legs? I had my right leg done on January 29th. Two days in ICU and one in regular room. I gained fifteen pounds in my right leg it was Hugh. Surgeon had to use artificial vein because mine was not in good shape. It's been three weeks and it still hurts to walk and get comfortable at night in bed. All my swelling is gone and my leg has good color and warm to the touch instead of cold all the time. I'm getting around pretty good but slowere than normal. I see the Dr in a week and hopefully he will tell me that I can drive again. It gets really boring at times. Sure hope the pain goes away soon. Has anyone had the same as me and recovered faster? My husband had stents put in both thighs and 1 in lower abdomen. Its been 2 weeks and today he is complaining that his feet feel like he has medicated foot powder on them...kinda tingly feeling. I had a fem pop on my left leg four weeks ago my leg from knee to my feet is still numb and very painful does the feeling ever come back? I had the adbonanal bypass in 2014 and having problumes with pain in right leg i have read that serrapeptase gets rid of plaque.would it damage my bypass that they put in ? Is it possible to donate a vein to a sibling who needs a fem-pop? I had my fem pop July 2004 due to a severe (groin to knee) blockage in my left leg (minor in right) and except for a infection after discharge I had no problems. I developed spine issues a year later and most recently have right groin pain, even to touch/press and my physical therapist thinks my groin pain and added back pain could be caused by a problem with my fem pop surgery. Is this possible??? I have also been having some other strange symptoms IE severe head aches, occasional low (50's) heart rate, unexplained bruising on my right arm and a much colder right hand. Is any of this related? I was told to discuss this ASAP with my PC doctor but couldn't get a appointment for nearly 7 weeks. How concerned should I be??? My father had a fem pop in 2013 with no relief. We since realized that the dr. Had received his education from Argentina. We changed doctors and my father, now aged 78, has had a fem pop done on both legs with the new doctor and has gotten great relief. He no longer feels pain when walking. If you still feel pain there is a reason. I would try getting a second opinion. Your choice of doctors could mean your life. Research the doctor you choose for ANY bad reviews. Read the reviews and what others say before allowing them to perform surgery on you. It makes all the difference. Hi. I just turned 40 this past March. My issues came on suddenly. I'm a nurse so on my feet pretty much my entire shift . All of a sudden within 50 feet or so my legs would hurt and go numb. My toes would turn purple and white and then feel like they were on fire. I would scream sometimes the pain was so intense. I've had 4 children and the pain ofor labor was easier. An angiogram showed 100 percent occlusion of my aorta and my iliac arteries. My vascular surgeon placed three stints. They said things went well. Then I tried to walk. I had slight improvement in my right leg and no improvement in my left. They found that the stint on the left was bring pinched. New plan was to go in and widen or replace the left stint. So surgery number 2. I wake up from surgery and I say yay. Made it through another surgery and so glad to be done. My parents and brother and boyfriend are all there and they all look very uncomfortable and my boyfriend has tears in his eyes. So I demand to know what's wrong. They tell me the stint thrombosed and they couldn't do anything for fear the clot would travel causing amputation or worse. So surgery 3. Aorta bifemoral bypass. I am currently still on the healing stage. My 46 staples from my breast bone extending to my pubic bone are due to come out in 10 days. I've taken very short walks and have felt ok but not great. Yesterday I tried a little more activity. Both legs ended up feeling cold (in 90 degree weather) and my right leg and foot hurt so bad it kept me up last night. Today even short walks have caused pain and weakness in the right leg. My work has let me go due to being off too long medically. With that I've lost my much needed health insurance. I fear my career as a nurse may be over if my condition doesn't improve. I've submitted an application for state insurance after I've lived for all my years without ever receiving or needing help from the state. I'm so discouraged. And kind of just sad. Trying to find the sun through the clouds right now for sure. My sister had a aortic, bilateral federal bypass graft performed in 2000. She has been fine up to now . She won't let me see her feet that are causing her pain/discomfort. She puts me off with statements that her shoes caused her toes to become "bruised". It has been 2 months and she insists it is just brushing from shoes. Refuses to let me examine her feet. I am very worried there is more going on. How long do these procedures Last? Worried sick sister. P.s. she was age 60 the year or surgery. Hubby just had leg bypass surgery Oct.19 the incision goes from groin to his ankle. After reading all of these notes I have no idea what to expect. This is surgery #6 the last ones were to replace the arteries in his groin because they were blocked. The Dr. said recovery will be long, hubby is 68 he is a former smoker but stopped 10yrs ago. He will be having physical therapy 3x a week. I hope we made the right decision he was so active and now he can do nothing!! had a bypass due to blocked arteries - doctor tried to do stent in July in left groin but it was too hard and could not penetrate - On 9/23/16 I went in thought he was going to try to go through right groin but instead he did a bypass - claims I had many blocked arteries and he had to go through my chest to catch a vessel to bring down and split into both legs. Now in my chest area it feels like I am carrying weight - just recemtly I noticed that a had a bruise on my breast about three inches in width and about 6- 7 inches long - did not hit my chest. Not sure how I go that I have numbness/tingling and sharp needle pain from the inside of both legs from the groin now just past the knee area. Doctor said if would go away after a few weeks but instead it has spread further and is getting worse. I am so uncomfortable and cannot sleep which is not helping either. I can't get comfortable and because of the pills they have me on I have to urinate about 5 to 6 times per night which also interrupts any sleep that I can catch. I am so sorry that I allowed this surgery to take place. My legs does not hurt like it used to but instead I feel achy in my legs after I walk a distance. Amy thoughts on what I can do to feel more comfortable. I had a femoral bypass using the sapphenous vein Inverted and used for the bypass. This was a result of increasing PAD pain. The question I'm asking is , I have flow and pulse back but numbness is prominent as is swelling in my lower leg and foot, this happens after I've stood or walked quite far. I also get intermittent throbbing in my foot and toes in the evening. What I'm wanting to know however , is this normal after 4 months? I have had a heart by pass and leg is taking ages to heal. Suggested have an Angiogram to check blood flow etc. How will they help leg wound to recover? Or would I need Angioplasty? Great treatment through NHS. I had a femoral distal bypass in Brighton on 20 December 2016,after the operation some leakage,she and pain,going home still very painful in leg, especially top of leg,,Does anyone know risks percentage of problems. Had occluded artery in right leg operated on one month ago. It was quite extensive and took 78 staples to close up the incisions. It was on the inside of the right leg. Still have redness around 2 of the 5 incisions and swelling by the knee and ankle. Am taking blood pressure medication, anti coagulation meds, and pain med when necessary. I noticed a small indentation about 3 inches above the ankle along the route of the bypass below which the swelling is greater down to the foot. The healing process has not gone as quickly as I thought it would. Have check up with surgeon in 8 days. Any comments or concens? My mother had femoral popliteal bypass surgery on her left leg on January 24, 2017. She died Feb 3, 2017 from the results of a "surgery gone bad." Please think twice about having this surgery if there are any other alternatives that will work for you. My mom turned 84 in the hopital 2 days after surgery. When she went in to hospital, she was a very healthy 83 yr old woman..no diabetes, no heart problems EVER, nothing but weakness in her legs from blocked arteries. The plaque broke loose from the artery during surgery and ruptered the artery. She had a heart attack from blood loss, went to ICU after surgery, contracted a bacterial infection called C-Diff which turned into sepsis and we lost the most precious thing in our lives. She had just gotten married in Dec, 1.5 months before she died. A very, very sad situation. Please do all your homework about this surgery before you agree to have it. I have a blocked artery between thigh and knee. I have got to have I believe it is called an angeagram X Ray. This occurred about 6 weeks ago and the initial symptom was aching of the calf muscle and is very limiting. I really don't fancy a bypass but if it is the only way, so be it. I just wandered whether the veins, arteries could compensate and take over the original flow without the need for an operation. The aching is less frequent and I can walk further. I had surgery on 15/10/2016 with PEFT graft 8cm on knee the way of surgery was wrong after 6month the graft was repeatedly blocked. Then I was next surgery on dt 10/7/2017 . My older PEFT graft was stay in same position. The Dr didn't remove it. My question the graft will harmful on my body. How many of these operations for blocked arteries in the legs are considered to be successful??? Do you have a percentage you could give me?? Does Medicare cover cost of surgery? With surgery done on leg and toe was taken out too at the same time. Is there any risks that we might be looking at? Patient is on dialysis too. Please advise. I had surgery on my lower spine and resulted with a fusion of a few vertebrae, back in October 2016. Within a few weeks after I ended up with blood clots in my right leg, popliteal artery area. I then had a stint put in a few weeks later after my leg and toes turned blue. A few days after that another surgeon tried to do another stint procedure but had a problem. Instead after being checked out by my cardiologist, ok, I went under the knife once again for a Fem Pop procedure. Now its November 2017 and I have almost always had swollen feet since my Fem Pop surgery and for the past few months its been a struggle dealing with severe ankle pain and difficulty walking. It seems to be a chore just trying to stand up after kneeling down. Is there anyone out there, that has any good comments and personal experiences that may have paralleled my journey? I am hoping that there is a doctor who knows what in the world is going on in my body, because I have been seen many, many, times by my General practitioner, Vascular Surgeon, Rheumatologist, Cardiologist, Urologist, Neurologist, and not one of them for the past almost 12 months can tell me what is wrong in my body and how to fix it, if it was possible??? All I know is everyday and evening I have to swollen 10 -15 pills each day and night. Please feel free in communicating with me if you have factual and helpful info. Thank you very much for taking time in reading my message. My husband had a femoral and tibial By Pass. He is 52 years old., aneurysm was genetic in cause. Surgery was 3 month ago, he recovered quickly and resumed normal life. My question is can he ski or bike? How do I get the answers to the questions? I have questions that relate to the questions posted here. I need vascular surgery as the stent that was placed in my artery in the right leg 14 months ago is failing. I need some help understanding how doctors think. My husband had a fem-pop last year in September, he is 52 years old. In February is year we noticed that is something wrong with the leg, sure enough, went to the doctor and initially he said that the bypass is clogged at the calf portion of the leg. Today, after months of walking and no improvement, we find out that the bypass is completely clogged, and the aneurysm is getting blood from somewhere? In my humble opinion, the surgery was botched, but I am open to any suggestions and/ or advice..
My husband had the vascular graft surgery in October 2017. The incision did not heal right and he had to have another surgery in November to close the gaping hole (the size of a dime) in his leg. We thought everything had finally healed, but just recently his leg started to hurt again with pain going up to his hip and down to his foot. There was swelling just above the knee and a sore on the incision where the graft went in. Several trips to the doctor, overnight in the hospital, trip to ER and doctor. Finally a doctor drained the leg which gave some relief for a while, but the leg has swelled up again and is very painful. We are on our way to the ER...again. am scheduled for bypass surgery on April 30, 2019. I am very apprehensive about getting this done. I only hear bad comments about this operation, are there any favorable results from this sort of procedure?